This is our 2nd Stroll on Sunday event and if last year’s weather is anything to go by, should be a lovely hot day, fingers crossed! 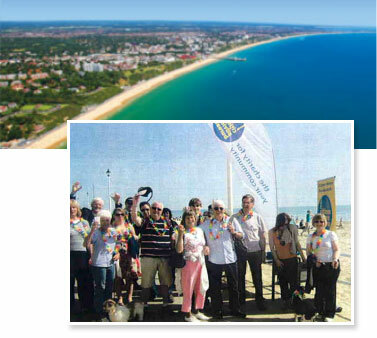 The Stroll begins at Bistro on the Beach at the bottom of St Catherine’s Path and goes to the Southbourne Cliff Lift where there will be refreshments provided. After this you can continue your stroll or return immediately to the start point where you will be awarded a garland of achievement. The registration fee is £5 for over 18’s and £2.50 for under 18’s, OAP’s and DWP beneficiaries. All profits will go towards specialist advisor recruitment and training for Citizens Advice Bournemouth. Please visit our Virgin Money Giving webpage to create your own fundraising profile for this event and pay your registration fee. Why not see if you can get a few friends together to join in the fun. This event is open to the whole family including the dogs so please do join us for some gentle exercise, breath taking views and fresh air! Registration from 12.30pm at Bistro on the Beach Solent Promenade, Southbourne Coast Road, Bournemouth BH6 4BE. Bournemouth beach is also one of the safest beaches in the UK with RNLI Lifeguards based all the way along our seven mile stretch of beach. We also have lifeguards based to the east of Boscombe Pier 365 days a year.